Nowadays customers often engage in the internet more than other channels. So, advertisers are also following this trend. More than two-thirds of the world’s population is online. Therefore, the percentage is increasing tremendously every day, and the world is getting digitized. But, digital marketing is not as easy as traditional marketing. It has made such a noticeable impact on our livelihood. So, having got insights into the digital marketing, organizations around the world are ready to fulfill different business objectives in Marketing, Product Development, Research, CRM, and Sales. The main feature of Digital Marketing is promoting goods or brands on digital media. Digital marketers have to carry out marketing campaigns on digital channels – email, website, mobile, etc. to create awareness, offer information to prospects, and draw qualified candidates to conversions. Due to the scope and reach; organizations increase their digital marketing expenses. According to Smart Insights and TFM&A, “One-third of businesses are planning to introduce digital transformation programs – and one-third already have”. “On an average, 60% of a marketer’s time is devoted to digital marketing activities, fuelling demand for digital marketing skills” – Smart Insights and Ecommerce Expo reports. Since digital marketing is a new field, companies have set a goal to get the best results. Therefore, they require qualified digital marketers who are expert in the domain. It opens a lot of possible for traditional marketers, fresh talent, as well as graduates from other fields to start a career in Digital Marketing. If your profession is in the traditional marketing area and you wish to become a digital marketing expert or a freelance digital marketer; you may be admiring on this domain. Because it offers lots of courses on digital marketing through workshops, online, and individual coaching programs that helps you build a strong career. To shine in your career, you should be aware of the current trends, technologies, and events taking place around the world. This field encourages Digital marketing specialists to share their experiences, knowledge, and ideas to teach others. So, you have to welcome the fresh updates which happen in digital marketing. To impress your employers; follow the blogs of specialists from the industry and attend conferences. Digital marketing requires some analytical skills. Analytics presents you the data which enables you to plan the estimate performance and online marketing campaign. Be it checking the conversions of an eCommerce site or engaging with customers on social media and publishing content, analytics guides you how to proceed, and reach your goals. There are more tools like Google Analytics that you can learn to obtain expert certification. And it adds more importance to your Digital Marketing resume. Skilled digital marketing specialists are less in India. So, if you are high on making a difference, then keep updating your digital marketing skills. Through an expert digital marketing training institute in Chennai such as Zuan Education, you can improve your knowledge and develop your skills, working principles and modern trends occurring around social media and SEO. Build a portfolio which has to manifest the success of your career. Emphasize examples of your earlier projects that you have worked on and produced pleasing results. Point out the amount of traffic or conversion rates you have made for websites. If you begin your career in web designing, a portfolio with its appearance on your resume will make employers take your profile more sincerely. Once you enter the field of the digital marketing industry, huge chances will come in your way. So, join groups linked to any topics of digital marketing and have a discussion with people about the current trends who have the same ideas. If you want to extend your profession in the digital industry, you can encourage others to do the same. Guide and train your young co-workers. It will show that you have a passion for your work. And it will assist you to earn the trust and support of others. We recommend this Digital Marketing Expert Certification Course to help you get a grasp of this. Want to start a career in Digital Marketing? Here’s a checklist to practice it on a small scale to become a self-made digital marketing specialist. Begin a blog: Select a topic that you want to write a blog. It costs approx. $50/year for domain and hosting. Learn and execute SEO (Search Engine Optimization): Write SEO optimized articles in your blog. If no one reads your blog, SEO will assist. Measuring through Google Analytics: Introduce Google Analytics tracking code and review if your site is getting some traffic by making proper use of analytics tools. Excellent content marketing: Write a lot of suitable content and enhance the articles on your blog. Apply for Google Adsense: Sign up for Google Adsense and use advertising codes in your blog. Exposing Google ads is the primary source of income for new blogs. Social Sharing: Install social sharing buttons in your blog articles. You can do this with widgets/plugins, and it is free of cost. Allow email subscriptions: Start collecting email subscribers for your site by installing email signup forms on your blog. It will help your readers get emails whenever you publish something on your blog. Create a Facebook page: Dedicate this social media to your blog and share the articles on your Facebook page. Also, execute Facebook like box on your blog. Utilize Facebook ads: Improve your page with Facebook advertising. Pay $10 or more for Facebook ads and direct more traffic to your blog. Try Google Adwords: Pay for Google ads for directing traffic to your blog. Registering an Adwords account and researching some keyword will help you what people search for in Google to get knowledge on the topics you blog. Begin with very moderate CPC bids. For the improvement; most current Adwords accounts get a free $100 credit. If you can’t get it, ask Adwords support, and it will provide you free credits to get you started. Consider Email Marketing: Get into an email marketing service like Aweber costs $20/month. Also, try MailChimp. Raise your Facebook presence through email marketing, and in return, you will get more email subscribers from your Facebook page. Ponder on your journey: Recall and understand how your blog got influenced and keep on going. You can’t become an expert in Digital Marketing by just 30 hours of practice, but compared to the marketers outside, you will be quite a qualified digital marketing professional. After this, you can proceed to scale up your mini-project and include even further things to it to become a freelance digital marketing expert. Once you’ve finished this keep on practicing it, then, you’ll understand the art of digital marketing. Since the field of digital marketing is in huge demand, you have to remain on the top of knowing about and executing the greatest and latest strategies. Otherwise, everything will go vain. 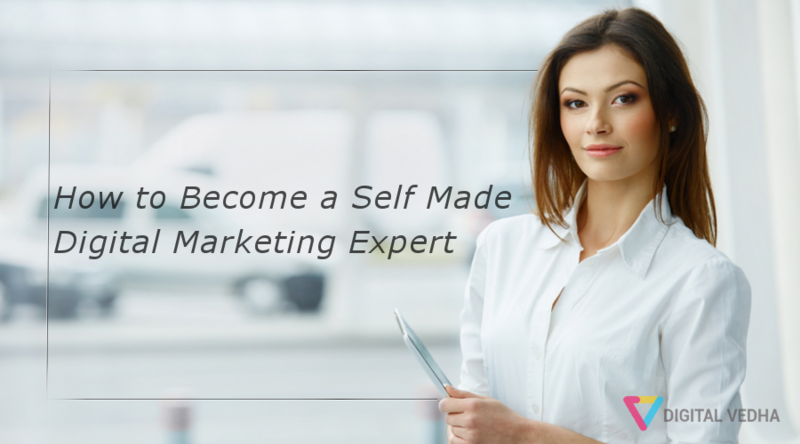 We wish that this self-help guide in becoming a digital marketing specialist is valuable to you and relatively simple to execute it right away.